Mmes. Sylvie Mora and Maldan-Lacombe by 1966. In a simplified landscape dominated by vibrant reds and oranges, three young women in traditional Breton dress ceremoniously gather chestnuts. The even rhythm of the huge flat leaves and round chestnuts creates a flat, decorative pattern that recalls medieval tapestries. Repetition and simplicity empower the image, evoking a mood of tranquil beauty. Many avant-garde artists favored the production of large-scale decorative works, intended for private homes. 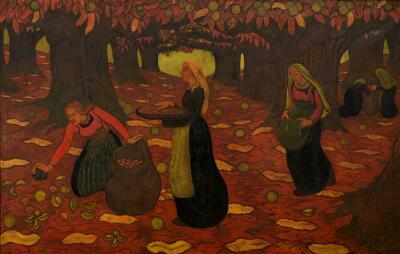 Chestnut Gatherers is one of four panels representing the four seasons, executed by Georges Lacombe for the sitting room of his future mother-in-law. Here, you see autumn—summer and winter are now lost; spring is at a museum in Geneva. Lacombe was a member of the Nabis, a group of young painters who challenged tradition by radically flattening pictorial space, using dark outlines and patches of bold color.